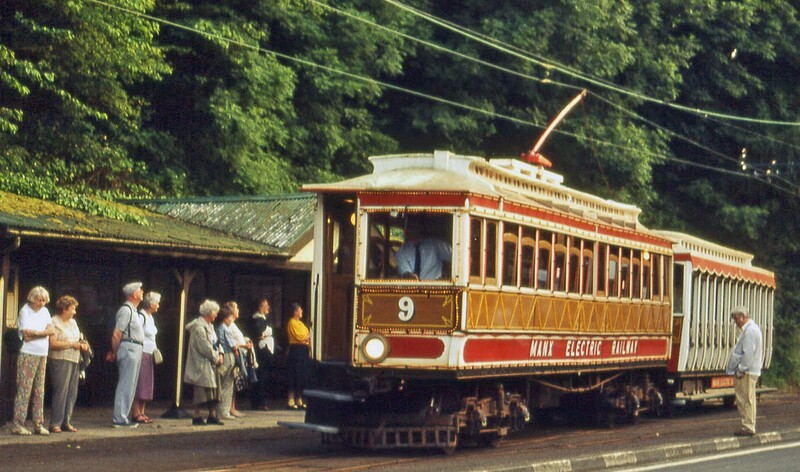 When the Manx Electric Railway was developed in the 1890s it brought the best and newest transport technology to the Isle of Man and opened up the east of the island to property development. It was masterminded by energetic engineers and financed by smoke and mirrors. In 1889 the manager of Dumbell’s Bank, Alexander Bruce, and a civil engineer called Frederick Saunderson bought land north of Douglas and sold it on to Douglas Bay Estate Company for housing development. They consulted leading experts in the new technology of electric traction, Dr Edward Hopkinson and Sir William Mather of Mather & Platt, Salford, over the construction of 2¼ miles of 3ft-gauge track from Douglas to Groudle, with gradients of 1 in 24 at each end of the route. The initial service, using three electric cars, began on September 7th 1893, and carried over 20,000 passengers in the first three weeks. The following year the original company was renamed the Douglas Bay Estate & Groudle Glen Company Ltd, and it promoted the Douglas & Laxey Coast Electric Tramway Company to extend the line to the harbour town of Laxey. The company, having taken over the Douglas horse-trams and promoted the Upper Douglas Tramway, was renamed the Isle of Man Tramways & Electric Power Company Ltd. It subsequently took over Bruce’s Snaefell Mountain Railway which ran from Laxey to the top of the island’s highest peak. By the time the line reached Ramsey – 17½ miles from Douglas – in 1899, the Isle of Man Tramways & Electric Power Company had become an established and powerful force in the Island’s economy. The company was carrying well over two million passengers by 1896, a quarter of them on the partly-completed electric railways, and 2,500 tons of goods, including quarry traffic. However, expenditure up to early 1899 amounted to £518,000, which was covered by capital of only £336,000. Half-yearly dividends of up to 8½% were paid, and the company secretary, quietly and understandably, resigned in January 1900. When in February 1900 Parr’s Bank foreclosed on a loan of £150,000 to Dumbells’ Bank, the bank, and with it the tramways and the power company, were finished. The electric railway, along with the Douglas horse and cable trams, continued to operate in liquidation, and the Douglas-Ramsey and Snaefell lines were purchased in 1902, first by a UK syndicate for £250,000, and then sold on to the London-registered Manx Electric Railway Company for £375,000. This new owner put the electric railways back on their feet, repurchasing in addition the Dhoon quarry and the original company’s string of hotels. It also opened the Snaefell Summit Hotel in 1906 and owned or operated the Laxey, Ballaglass, Garwick and Dhoon glens as resorts. In 1906 the electric railways carried 535,021 passengers, generating £34,279 profit. By 1913 over 700,000 passengers were carried, and the undertaking was solvent and paying dividends. So the Isle of Man gained a superb late-Victorian transport facility which earned its keep well into the twentieth century and remains as a much-loved government-owned tourist attraction that has repeatedly escaped closure by the inimitable twists and turns of Manx politics. This entry was posted in Manx Heritage, Transports of Delight on January 27, 2014 by Mike Higginbottom.